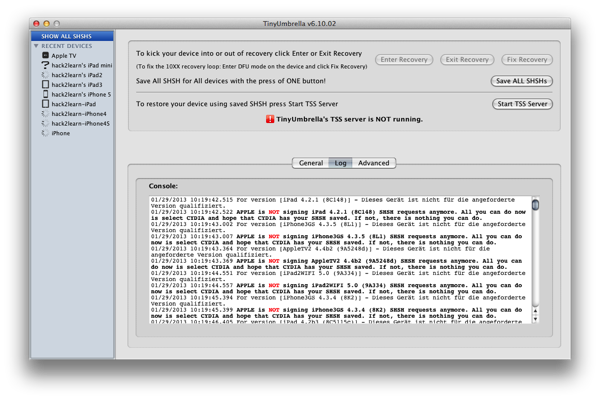 Saving your SHSH blobs allows you to restore any firmware version that is no longer signed by Apple. TinyUmbrella, the software used to save SHSH blobs in order to downgrade or restore your device is now ready to offers compatibility to iOS 6.1 devices. When iOS 6.1 was released on the market, TinyUmbrella developers hurried to upgrade the software in order to offer compatibility and support for the latest firmware. Now, TinyUmbrella version 6.10.02a supports both iOS 6.1 and iOS 6.0.2, which was unavailable until recently. According to TinyUmbrella developers, the new version should offer automatic upgrade, an improved and a clearer code. This new version also includes a Spinny improved UI, proxies and a better port 80 detection. In the same time, it will be easier for you to keep a track of connected devices because the software keeps a history of detected devices. Therefore, the next time you connect your device to your computer and you want to save SHSH blobs using TinyUmbrella 6.10.02a, you will be able to find your device in the connected devices list quite easy. So, despite the operating system version you use on your iPhone, iPad or iPod Touch, you should consider saving your SHSH blobs before upgrading to a new firmware. This will allow you to jailbreak your device in the future, or to downgrade it to a previous firmware if you want. Hurry to download TinyUmbrella 6.10.02a for iOS 6.1 in order to save SHSH blobs on your iPhone, iPad or iPod Touch. Jailbreak iOS 6.1 with Evasion tool is now available for all iDevices, just follow our step by step instructions posted in our Jailbreak Guides section. 0 Respones to "Download TinyUmbrella 6.10.02a with Support for iOS 6.1"